REFF. The reinvention of the real through critical practices of remix, mash-up, re-contextualization, reenactment. 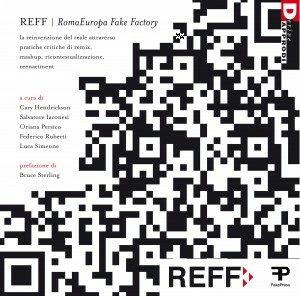 The book by REFF RomaEuropa FakeFactory is out! 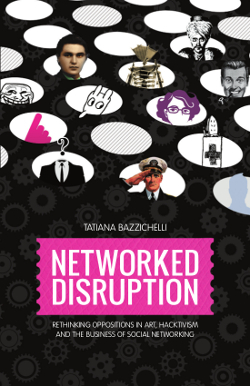 I contributed with an essay for the section VOICES, with the title: The Disruptive Art of Business. Published by Derive Approdi, Rome, Italy, 2010. Language: Italian. The fake competition RomaEuropa FakeFactory (www.romaeuropa.org) was an act of artivism, in favor of free culture and non-proprietary rights for authors. This network confronted the themes of art and hacking, political activism and technology, copyright and intellectual property and extended to access, cultural politics, crowdsourcing, open source models, peer-to-peer economic governance and the reinvention of the real. The story begins with the section “VOICES”: a collection of more than 30 theoretical works on the themes of Free Culture, remixing as creative practice, the re-contextualization of urban spaces and knowledge sharing from international scholars such as Richard Barbrook, Andy Cameron, Stephen Kovats, The Yes Men, 0100101110101101.ORG, Jasmina Tesanovic, Massimo Canevacci Ribeiro, Antonio Caronia, Tatiana Bazzichelli, Marc Garrett, Francesco “Warbear” Macarone Palmieri and many others. A catalog of the works presented by 32 artists, writers, designers, hackers and architects from all over the world follows in the section entitled “VISIONS”. These contributions give a voice to the unexplored scenarios of contemporary reality representing the worlds of innovation, appropriation and a continuous artistic and political reinvention bringing to light examples of new production models based on freely available contents, knowledge, connections and the possibility of reproducing, remixing and arranging contents, forms and objects; new technological practices, new forms social interaction; new opportunities for building unedited, self-determined imaginaries. The software is deposited on paper as hypertext, making it clickable, expandable, commentable and reactive, opening a virtually unlimited space for comparison between authors and readers on issues and debates on the book, dissolving the traditional boundaries that separate them. This book develops a new prototype of infinite potential for the intersection between digital and paper dimensions and, thanks to a special application, is available on the web or via smartphone: it is ubiquitous and cross-media publishing, a new way to “write on the world”. The REFF project aims to advance the experience of similar publications by offering an Open Source tool – thanks to a publishing platform created by FakePress and used for the first time in the making of the REFF book – this tool is freely available to anyone looking to create their own cross-media publications. This book is licensed under the Creative Commons Attribution-NonCommercial ShareAlike 2.5 Italy.